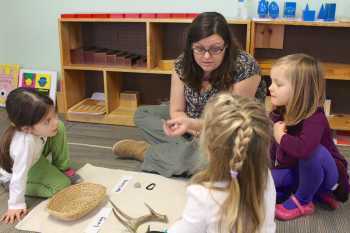 The Montessori approach offers a broad vision of childcare and education as a way of life. It is designed to help children with their task of inner construction as they grow from childhood to maturity. It succeeds because it draws its principles from the natural development of the child. Montessori classrooms provide a prepared environment where children are free to respond to their natural tendency to work. The children's innate passion for learning is encouraged by giving them opportunities to engage in spontaneous, purposeful activities with the guidance of a trained adult. Through their work, the children develop concentration and joy-ful self discipline. Within a framework of order, the children progress at thier own pace and rhythm, according to thier individual capabilities. "I have studied the child. I have taken what the child has given me and expressed it, and that is what's called the Montessori method"
There are several different, yet integrated, areas of learning in a Infant & Toddler, Pre-School, or Elementary Montessori classroom: practical life skills, sensorial development, language, mathematics, history, science, and cultural studies (geography, art, music). In addition to the available materials in each area, children might also take time out during the day to sing songs, read a story, or enjoy nature. Children have both individual and group lessons in each area. Throughout the day, children are free to work with the activities. Emphasis is placed on helping children choose pursuits that are of interest to them, thus supporting the child’s natural curiosity and desire to learn. At the elementary (6-12 years) level, you can also expect to see children working together on projects, since collaboration at this age helps the child to become socially adapted to society and aware of the needs of others. What you will not see in a genuine Montessori program are systems of rewards and punishments to promote work or control behavior. There will be no lost recess, gold stars, or grades. In a Montessori class, children are engaged, active, and respectful because they are internally motivated, spending their time in an environment that consistently supports development of their will—that is, positive willpower and self-control.